So The Boy Most Likely To put me right back in the mood for some solid contemporary YA. 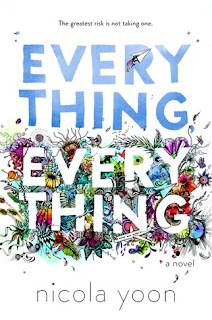 I immediately turned to my ARC of Nicola Yoon's debut novel Everything, Everything. I'd been looking forward to this one for awhile but holding onto it until starting it felt right. I can't be the only one who does that, can I? Ours is not to question why and all that, I suppose, but seriously why sometimes can I not just dive right into a book I've been dying for the moment it finds its way into my grabby little hands? Frustrating doesn't even begin to cover it. In any event. I'd also been meaning to feature this cover on a pretties post for awhile and just never got around to it. But can we go ahead and just take a moment now? Because it's just perfect, even more so after having read the book. I can't wait to pick up my copy in person and just . . . stroke it. Madeline Whittier has no memory of ever being outside of her house. Afflicted with a genetic disorder known as SCID, she risks death in short order should she venture out of the confines of her immaculately sanitized home. And so she floats through her days taking courses online, playing phonetic Scrabble with her mother, exchanging jokes and book recommendations with her longtime nurse Carla, and making notes, doodles, and lists upon lists about what life would be like. If. Then. Then Olly moves in next door, and everything changes. Suddenly Maddy's days fill up with all sorts of new things. From Olly's messages written in marker on his window and their daily IM and email sessions to her mounting curiosity over what he gets up to when he climbs up onto the roof of his house and her concern over how dangerous his father's abusive outbursts may actually be. The question is how long will this virtual relationship they've struck up (and the glimpse of the outside world Olly provides) last before they just won't be enough anymore? Maddy is irresistible. I absolutely loved Olly as well, with his unrelieved black and his Spider-man tendencies. And the two of them together are charming beyond measure. But Maddy is the reason to pick up this book. The way she narrates her life—its limitations, the only color in it provided by the book spines lining her room—is simple, open, and mesmerizing. It is the opposite of difficult falling into her daily routine, into her complicated relationship with her mother, into irrevocable love with the boy next door. She intersperses her words with charming doodles and drawings illustrating the quintessentially Maddy way she sees her place in the world. I was behind her from the opening lines as I watched her carefully compose and write her "Reward If Found (check all that apply)" lists inside the flap of each new book she gets. As she read Flowers for Algernon over and over again, waiting for that day when it wouldn't make her cry. Throughout the book, even when I felt the inclination to question her decisions (and believe me—I did—particularly at two pivotal moments when life, the universe, and everything felt like they were going to spiral out to sea), I found myself giving Maddy the benefit of the doubt. And she always came through. Her reasoning felt consistent to me, her rationales never drifting so far from the vicinity of the reality she was given that I couldn't find it in me to follow. Much like Olly, I was never going to tell her no. "Tell me about him," she says. I've wanted to tell her about him for so long, but now I'm not sure where to begin. My heart is so full of him. So, I begin at the beginning. I tell her about seeing him for the first time, about the way he moves—light and fluid and certain. I tell her about his ocean eyes and callused fingers. I tell her how he's less cynical than he thinks he is. About his awful dad, about his dubious wardrobe choices. I tell her that he thinks I'm funny and smart and beautiful in that order, and that the order matters. It does matter. Pretty much everything about this lovely novel mattered to me. Everything, Everything is due out tomorrow. The Book Wars - "Yoon is able to grasp the heart of the character and wrangle from them sincerest emotions they are capable of." Good Books and Good Wine - "I found myself wanting to dog ear pages of this book – especially as I could relate to Maddy’s love of books and her love of life in general." Quinn's Book Nook - "I laughed and teared up and fell in love and at times I was so angry." The Review Diaries - "All in all this is going to be a novel that gets people talking." There Were Books Involved - "It was so much fun, full of sweetness and heart, and I loved every minute of it."